While seated at Your tongue-tip, o Mother, in turn attains to rubyhood in its bodily form. Prayers could be expressed in words or, as in India, through the throwing of flowers, the favourite colour being red or magenta. Such is the underlying idea with which we have to understand the meaning of this verse. Whether said in words or in flowers, it is the same absolute devotion that is implied. To put it in another way, we could say that the word-language participates with the flower-language and vice-versa. Words are more on the side of the intelligibles, while coloured flowers represent the perceptibles or the medium aspect of language. There is a thin line of demarcation separating these two aspects of medium and message, which it is the purpose of the present verse to treat unitively. It is the tip of the tongue that repeats muttered mantras or charms. In South Indian temples there is the practice of dipping flowers in holy water and throwing them at idols. Such an action, which is visible, is accompanied by a corresponding muttered charm in the form of a predicative description of the god to be propitiated. Baskets, or sometimes forests of flowers are offered as "stainless shrines" and, as Sir Edwin Arnold eulogizes for Buddhism, countless millions of lips repeat the formula, "I take my refuge in Buddha." Such a flower language is proper to the context of idol worship as practiced to this day, especially in South India, The devotee forgets himself and is never satisfied with the number of times that he repeats such a gesture and its corresponding mutterings. In this verse the Goddess is worshiping her own husband in the same way. The duality between the muttered inward charm and the outward offered flowers is to be effectively abolished here. The poet finds a rather ingenious way of making the two events, verbal and non-verbal, belong together, either as cause (the flowers) or effect (the words), to one and the same context. The world of words properly belongs to the Goddess Sarasvati, to whom all colour is to be considered extraneous, because concepts, as such, are colourless; while percepts could belong to the colourful side of the same situation. If we should think of a small crystal-clear image of Sarasvati as representing the side of concepts, we could well imagine the tongue tip, where the mantra is articulated an endless number of times, as the ground on which the message could touch the medium. Thus we can see the relevancy of the analogy in this verse which put the red tip of the tongue of the Goddess at the bindusthana, or locus, around which Absolute Beauty is to be visualized. This series of verses favours the negative or perceptual perspective of the Absolute as against the merely conceptual one. It is for this reason that the second line proclaims that the red shade of the tip of the tongue is the locus of Absolute Beauty. On the tip of such a magenta-red tongue one has to imagine that someone has placed a crystal-clear image of the Goddess of the Word, Sarasvati. This image is also to be visualized in all its beauty as a universally concrete clear concept. The form of a concept and the name of a concept cannot be separated from one another. Every name must suggest some form or other, at least as a weakness of the constitution of our minds. One has to overcome the duality of both visual and conceptual conditioning habits of the mind to be able to transcend both, and to think without name or form at all. The Bhagavad Gita says in Chapter XIII that such a task of focusing attention on the formless and the nameless is difficult to accomplish. We are embodied human beings, it says, and therefore anthropomor­phism is a corollary to our thought forms, especially about God. This is the reason why God is referred to by the third person masculine pronoun, “He”, in most scriptures, as a concession to a natural way of thinking, though strictly speaking it is questionable. Anthropomorphism is thus a necessary evil, and can therefore be overlooked. The idolatrous imagery employed here is excusable only on the basis of a similar reasoning. 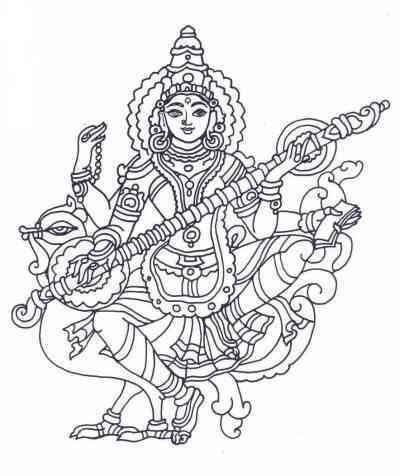 Sarasvati, the Goddess of the Word, has a traditional form known to the conventional Hindu mind. Unless we have some specific reasons to reject it, there can be no objection to the use of such an iconographic representation. When all these considerations are conceded, it will be seen that this verse does not offer any major difficulty, even for the modern reader. The underlying Advaitic doctrine is all that Sankara is interested in revealing, in a protolinguistic form. This is another example of anyonya adhyasa (mutual participation or conditioning). It is on the side of giving primacy to ontology that, if at all, this approach may be said to err. We have to remember that it is from a negative perspective that we are examining the content of the Absolute throughout this work, as we have been cautioned even from Verse 4, where the feet have been given primacy over the hands. Why the Goddess should indulge in incessant repetition of the name of her Lord, when She herself is of a divine status, might be a relevant question. The answer is that methodological consistency requires that the counterparts have the same homogeneous richness so that they could cancel out against each other. Incessant repetition is needed to give to concepts the same ontological richness that is conferred by nature from the perceptual side. Ruby-hood and crystal clarity condition each other at the tip of the tongue; where medium and message meet unitively. Constant repetition makes the tongue red and it passes to the numerator side. The same tongue-tip is used both for the abstract (metalanguage, or the spoken words of the charm) and the concrete (protolanguage, or structuralism): perceptual and conceptual meet there. 3) Throwing of red flowers. The tongue is praising Shiva's exploits, unceasingly. The Devi is a denominator factor here, as opposed to Saraswati, who belongs to the numerator side, where the metalinguistic praise of Shiva's exploits takes place. The words the Devi utters make up "the crystal-clear image of Saraswati"
Saraswati is the Goddess of the numerator world of words. This is the division between non-prophetic (negative) and prophetic (positive) religion. Numerator and denominator are here clearly defined. This is adhyasa, which means to have the colour of something else. The favourite example of adhyasa (condi­tioning) is that of a clear, colourless crystal placed on a piece of red satin. Without becoming red, the crystal is made to look red throughout. (See Verse 62 for several notes on adhyasa, as also Verse 92. AS NO STRUCTURAL DIAGRAM IS PRESENT IN THE ORIGINAL MANUSCRIPT, THE EDITOR PROPOSES THE DIAGRAM BELOW, WHICH APPEARS FULLY JUSTIFIED BY THE TEXT. IT IS A TENTATIVE PROPOSAL BY THE EDITOR, AND NOT ORIGINAL, AND MAY THUS BE IN ERROR.